It's happened! 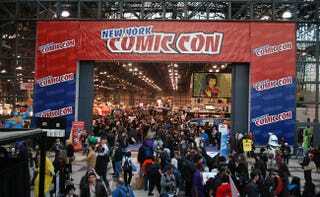 The recently wrapped New York Comic-Con has just dethroned the San Diego Comic-Con as the biggest comic convention in America, with over 150,000 attendees this past weekend — as compared to San Diego's perennial max of 130,000. As Comics Alliance points out, this jump in the NYCC attendance was likely bolstered by this year's decision to add Thursday as an official con day. However, don't expect all the movie studios and networks to jump ship from San Diego or anything just yet; SDCC still has more prestige, and its close proximity to Los Angeles makes it easier to send movie/TV stars and marketing teams and so forth. However, you have to imagine the San Diego Comic-Con guys will do something to respond. There have been threats of the con moving to Los Angeles for years and years now — I wonder if this will finally be the event that makes them pull the trigger.